RALEIGH, N.C., Feb. 1, 2019 /PRNewswire/ -- Lenovo is excited to announce the 2019 Presidents Day sale. 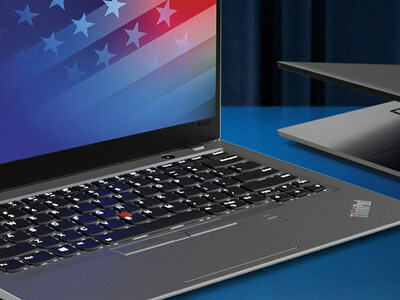 Lenovo says this is the brand's "Biggest Presidents Day Sale" ever. Throughout an extended sale period of February 11–24, 2019, Lenovo.com will feature deals on personal and business laptops up to 45% off, hourly and daily doorbusters, and deep discounts on computers, smart devices, and electronics accessories. There will be a pre-sale event before the main sale. Running from February 11-13, the pre-sale provides early access to the most anticipated sale pricing. The "Biggest Presidents Day Sale" will run February 14-24, kicking off with exclusive doorbuster deals available only on the inaugural day. The big sale will include some of the company's high-end products like the ThinkPad X1 Carbon (6th generation) and X1 Yoga (2nd generation). The ThinkPad X1 Carbon, an Ultrabook laptop with 8 GB memory and solid state drive, will start at $999. Recognized for its 2-in-1 capability, the ThinkPad X1 Yoga will be available at $1,000 off the standard retail price – that's a 45% discount. "Who doesn't love a good sale," says Carlo Savino, Lenovo Executive Director of eCommerce. "Our holiday sales period was incredibly successful; customer interest was significantly higher than we anticipated, and many doorbusters sold out before customers had a chance to claim them. We wanted to come back to that level of customer engagement. We're proud to continue offering deep discounts on high-quality technology for our customers." With the belief that powerful computing should be financially attainable to all, Lenovo is excited to offer interest-free financing during this promotion. Purchases made during the pre-sale period of February 11–13, 2019 will receive 0% Klarna financing on purchases up to $2,000. Klarna 0% interest will continue during the main sale, extending to cover purchases up to $2,400. Featured doorbuster deals will be available at https://www.lenovo.com/us/en/deals/doorbusters/. Visit www.lenovo.com to start planning for the Lenovo Presidents Day Sale event. Lenovo (HKSE: 992) (ADR: LNVGY) is a US$45 billion Fortune Global 500 company and a global technology leader in driving Intelligent Transformation through smart devices and infrastructure that create the best user experience. Lenovo manufactures one of the world's widest portfolio of connected products, including smartphones (Motorola), tablets, PCs (ThinkPad, Yoga, Lenovo Legion) and workstations as well as AR/VR devices and smart home/office solutions. Lenovo's data center solutions (ThinkSystem, ThinkAgile) are creating the capacity and computing power for the connections that are changing business and society. Lenovo works to inspire the difference in everyone and build a smarter future where everyone thrives. Follow us onLinkedIn,Facebook,Twitter,Instagram,Weibo, read about the latest news via ourStoryhub, or visit our website athttps://www.lenovo.com.